130M Euro of EU co-funding will be available in 2015 from Horizon 2020 to support the implementation of new Innovation Procurements across Europe. As the majority of the on-going PCPs are in the procurement execution phase it is the perfect time to start planning the deployment of the developed solutions. The 2015 H2020 PPI calls - that cover many domains of public interest such as education/e-learning, e-health, cloud computing etc - are presenting unique co-funding opportunities to support the deployment of innovative solutions through PPI. Proposals for new PCPs and PPIs that are not follow-ups of on-going projects are of course also welcome. 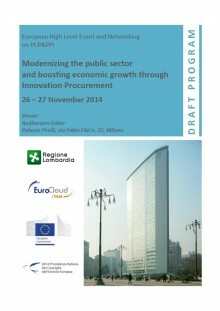 On 26/27 November the big annual high level EU conference with the title "Modernizing the public sector and boosting economic growth through Innovation Procurement" will take place in Milan Italy at the occasion of the Italian Presidency of the EU. The event is co-organized by the European Commission, the Lombardy Region and Eurocloud Italy. The aim of the conference is to share experiences about Innovation Procurement as driver for public sector modernization and creation of economic growth in Europe, plus inform and network procurers for the upcoming 2015 calls. 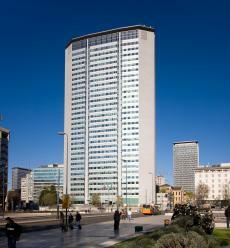 The conference will therefore also provide parallel sessions per H2020 Innovation Procurement call/topic. Do not miss this opportunity to learn more about the 2015 H2020 calls that provide funding for new innovation procurements. Join that conference, present your project ideas and network with other stakeholders that are interested to submit proposals in the framework of those calls.